Patterdale is a small village in the Patterdale Valley in the Lake District of Cumbria. The village has beautiful views of Ullswater and the surrounding mountains which dominate on one side by the Helvellyn range and by Place Fell on the other side. The village is situated on the Coast to Coast route at the southern end of Ullswater and is very popular with tourists whether strolling around the village or for the more adventurous walkers who will find that Patterdale is a great base for many popular fell walks. The village has two pubs The White Lion Inn and The Patterdale Hotel both have accommodation and the latter also caters for campers. The village store and post office sells a little of everything from food and drink to walking gear, maps, post cards and souvenirs of the Coast to Coast walk and the Patterdale Terriers. The store also bakes fresh bread and cookies daily and is known for their Cumberland Sausage Baguettes. Patterdale is the birthplace of the Patterdale Terrier, a working dog, sometimes called the Old English Terrier or the Fell Terrier and many tourists bring their terriers to the Patterdale Dog Show held yearly in August. The village is also home to St. Patricks Church and a small school. Mining was the main industry of this area until Greenside Lead Mine closed 1960 today the main industry is sheep farming and tourism. Grisedale Beck flows from Grisedale Tarn which is situated between the fells of Fairfield, Seat Sandal and Dollywaggon Pike down into Patterdale Common then through the valley of Grisedale and into the very southern end of Ullswater. This is a stunning valley, so do not forget your camera. Glenridding is another small village just about a mile north of Patterdale. Glenridding grew up around the Greenside Mine which is now the Helvellyn Youth Hostel and the village has much to offer with its two pubs the Glenridding Hotel and the Travellers Rest, restaurant, b&b accommodation, cafe, tearoom and a variety of shops including a newsagents, and a general store selling everything from food and drink to walking gear. The village is also home to the Ullswater Steamers who run cruises for the public which is a great way to see the lake and the superb views of the surrounding fells. The steamers run daily calling in at Pooley Bridge and Howtown. The steamers, converted to diesel during the 1930’s, were working boats in the 1850’s transporting mail, goods and workers to and from Greenside lead mine. Lead ore was discovered at Greenside in the 1650’s and Greenside Mine, the largest lead mine in the Lake District, was mined from the 1690’s to 1962. We park in the pay and display car park opposite the Patterdale Hotel. We turn right out of the car park and head along the road towards Glenridding. Just after we pass the church on our left and the police station on our right we turn left at Grisedale Bridge and follow the tarmac track with Grisedale Beck on the right. We ignore the track going over a bridge on the right and keep heading forward to the right of a farm. We keep following the tarmac track until we come to a gate next to a seat and a sign post saying Public Footpath Helvellyn to the right but we go forward through the gate. We pass Braesteads Farm on our left and follow the yellow arrow. The track becomes a stony track and we pass another farm on the left and go through the gateway. We then pass a stone barn and follow the sign for Grisedale Tarn and Grasmere and keep to the stone wall on our right. We keep heading forward uphill on the track to a footbridge over Grisedale Beck. We cross the bridge and turn right going slightly uphill to another bridge a short distance away. We cross the bridge and turn right onto the path, the path to the left carries on to Grisedale Tarn we are now heading downhill on the other side of the beck which is on our right. We keep heading forward on the path we are now on our way to Glenridding. We cross over a bridge at the base of the waterfall coming down on our left. We keep following the path and pass a reservoir and a farm on our right. Then after a short way we the path on the right goes down into the valley and back to Patterdale but we head forward uphill towards the trees in front of us and then bear to the left to Lanty’s Tarn and Glenridding. At the other end of Lanty’s Tarn we go through the gate and turn left then follow the path downhill which turns right, left and right again towards Ullswater and Glenridding down below on our right. On reaching a track we turn right with Glenridding Beck on our left. The car park and the tourist information are just to the other side of the beck. Then at the road, with shops on the right, we turn right and make our way to the boat yard. The footpath at the side of the road now disappears so we take the footpath on the right sign posted Patterdale that takes us back to Patterdale the safe way. 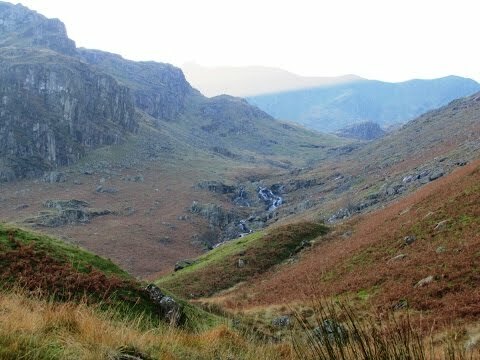 This is an easy to moderate walk following Grisedale Beck. Approx 7.5 miles using OS map OL5, The English Lakes North Eastern Area. There are public toilets in Patterdale and Glenridding for the time being but they are to close due to Eden District Council cutting the cost of funding. For refreshments in Patterdale there are two pubs the Patterdale Hotel and the White Lion Inn, Side Farm Tearooms and a village store and post office. For refreshments in Glenridding there are also two pubs the Glenridding Hotel and the Travellers Rest, Fell Bites Restaurant, Mosscrag Tearoom, Fairlight Guest House and Cafe and a few shops.